To make a pair of shoes for you we need a tracing around the outside of your bare foot and a measurement around the ball of the foot. A measurement across the arch at the highest point from floor to floor is also needed. Get someone else to do the tracing and measuring. Please do not use felt tipped pens. We also need to know if you have any peculiarities to your foot such as different sized feet, bunions or sore toes. If you wear orthotics, place them on the paper and stand on them when you have the tracing done. We also need and indication of the height of them so we know how much extra to allow. 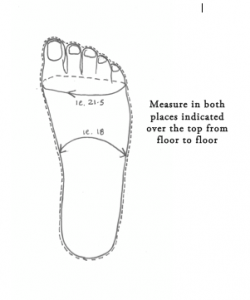 To measure the height of the orthotic draw a line on each heel and measure from the ground to the line, then stand on the orthotics and measure again to the line. The difference is the height of the orthotics. If you wish to order calf length boots please contact us as more measurements are required. Please send this foot tracing, along with the style of shoe and colour you want, to our address. Please let us know what type of sole you want. Payment methods include cheque, money order, direct debit and Pay Pal.